You'll have to forgive me, folks. I am really getting burnt out on Jess Franco. My review two weeks ago was disappointing. I was disappointed in the movie and in my review. Ugh. Thankfully, that little angel named Jess came through with a cinematic shot in the arm called Lucky the Inscrutable. Let's get crazy. 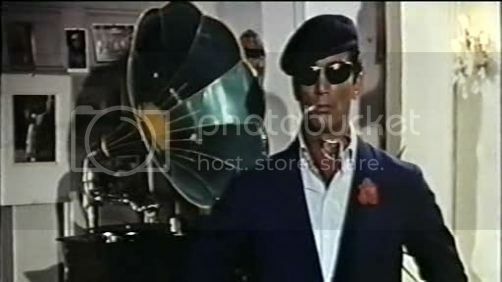 World class super spy/super hero/master of disguise Lucky the Inscrutable (played by Ray Danton) is hired by a secret society called Archangel to follow the trail of some counterfeit money in order to save the world's economy. Lucky teams up with a spy named Michele (Dante Posani) and off they go from England to France to Rome to Albania to wherever! Along the way they battle a vast array of double agents and soldiers armed with only their wits -oh, and guns and crazy spy gadgets. 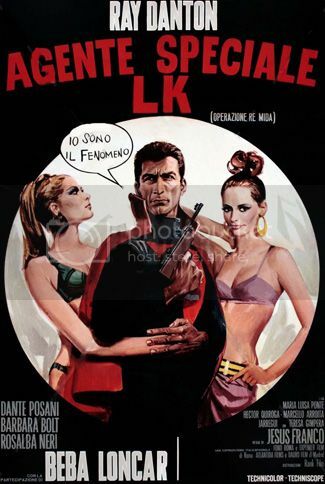 If you are looking for a pop art-filled film with a ludicrous plot to make a great double feature with Mario Bava's Danger Diabolik or Franco's Kiss Me, Monster, then stop because your search is over. The spy spoof sub-genre is a tough sell for most viewers but this is easily one of the best I've ever seen. The first reel of this film is perfect for the short attention span crowd. It is filled with murderous thugs, spies, go-go dancing, people in crazy costumes, comic book panels and word balloons, and lots and lots of color everywhere. 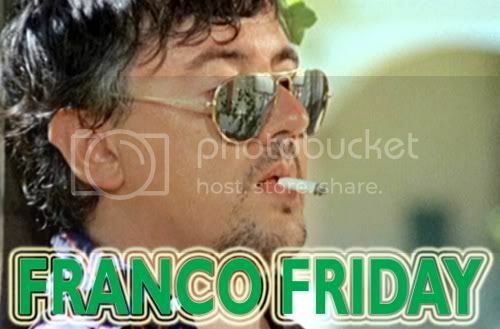 Lucky the Inscrutable has not one but two cameos from Franco himself. One as an understandably speechless man with a knife in his back and then later as a tramp riding a train. Ray Danton is definitely having a blast. 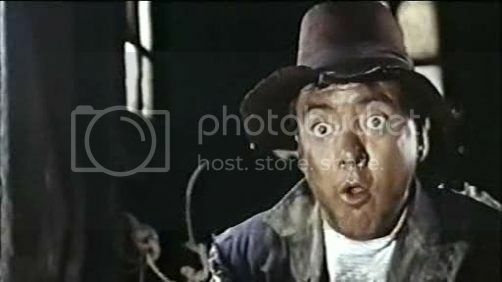 I like Dante Posani as Lucky's sidekick but I can't find any info on him. Rosalba Neri is so very young in this and is even more radiant than usual. The lovely Teresa Gimpera of Feast of Satan and Spirit of the Beehive is here too and the world is a better place because of that. My one criticism is that this film loses a little steam before its over. It never becomes a slog or anything -trust me, the mile-a-minute jokes never stop- but the barrage of color and attention-grabbing visuals fall away about two-thirds of the way in and Lucky the Inscrutable suffers for it a bit. That being said, the cinematography by Fulvio Testi is always good and the score by Bruno Nicholai never fails to keep your foot tapping. He even gives Lucky his own theme song! So yeah, definitely give this film a watch sometime. It is weird and a lot of fun. "They've got my friend! If they've done him any harm, I'll get even with them or my name's not Lucky the..."